Buy this new Tag Heuer Autavia Heritage Calibre Heuer 02 42mm cbe2110.ba0687 mens watch for the discount price of £3,697.00. UK Retailer. Polished stainless steel crown & round chrono pushers. 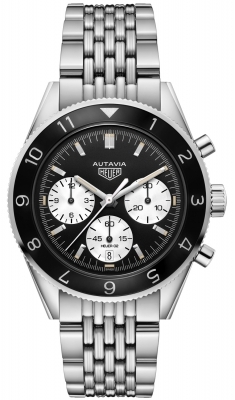 Black aluminum bi-directional bezel with 12 silvered hour graduations. Matte flat black main dial. Silvered sub-dial with a very fine & tight 'snailed' concentric circle pattern finish. Applied brushed & polished index hour markers. Polished central hands, hour & minute hands with vintage colored luminous fill. Tag Heuer Caliber HEUER 02, beats at 28,800 vph, composed out of 168 parts, contains 33 Jewels & has an impressive approximate power reserve of 80 hours.